Glaro Inc. wall mounted smoking receptacles are a sleek, modern, and durable solution for cigarette disposal. Completely weatherproof and fireproof, this collection of solid, seamless aluminum receptacles effectively keeps areas clean. 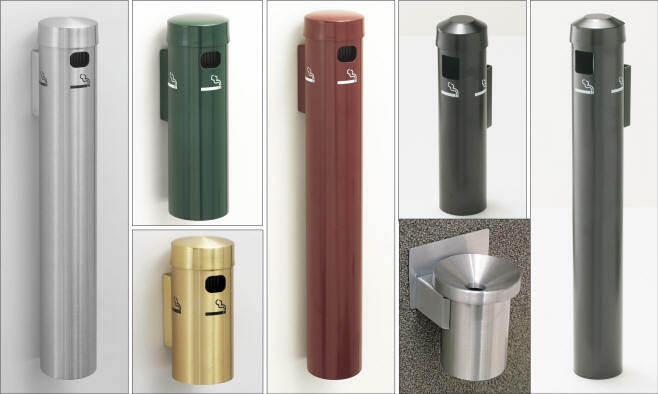 Glaro smoking receptacles have been designed with the preferences of designers, architects, purchasing professionals, and building managers, in mind. By using Glaro Wall Mounted Smokers Posts, any facility can be properly equipped with a combination of matching floor, wall, or table top cigarette receptacle models. Finish choices are satin aluminum, tarnish-proof satin brass, or 29 smooth or textures baked powder coat finishes. Other Glaro products used in public areas can be supplied in a matching finish. Glaro Smokers Post cigarette receptacles provide one of the most diversified selections, and they can be shipped from the New York Glaro factory within a few days. Glaro Inc. has been known as a leading manufacturer of cigarette receptacles since 1947. The company continues to maintain its high quality standards to insure the durability of all its products. Glaro continues to offer the time tested and perfected satin aluminum and satin brass hand polished finishes for the wall mounted cigarette receptacles just as in the 1940’s. Since then all Glaro products have been hand crafted and manufactured in the U.S.A. The original tubular style Cigarette Receptacles were innovated by Glaro Inc. This Glaro series of wall receptacles has maintained a reputation for being the most indestructible and best quality cigarette disposal receptacles in the industry. The Deluxe Smokers Post cigarette receptacles present a sleek and stylish sophisticated design to satisfy the tastes of the leading architects and designers. Inside the disposal hole is a “snuffer panel” to aid in extinguishing smoking material before dropping it in. Tops are secured to the body with a spring action push button mechanism. The 4400 series has a 3.5” diameter and a 1/8th” thick tubular wall of solid aluminum. It is offered in 8”, 12”, and 24” heights. This series is unique because its wall mounting bracket has a concealed customized key hole tamper resistant security feature. The back of the body tube has a matching keyhole. This design allows authorized personnel to release the body from the wall for convenient emptying and cleaning without a key. Finish choices are satin aluminum, tarnish-proof satin brass, and 29 smooth or textured baked powder coat finishes. Most other Glaro products can be provided in the same finishes to create consistency throughout a facility. The Value-Max Series offers a similar design to the 4400 series at a lower cost. They are just as popular and durable, weatherproof, and fireproof, as the 4400 series, making them an excellent choice for cigarette disposal. Each cover is attached to the body with a spring action push button mechanism. The 2400 series has a 3” diameter and a 1/16th” thick tubular wall of solid aluminum. It is offered in 12” and 24” heights. In addition, the 2400 series has the same unique tamper resistant wall mounting design and is available in the same finishes as the 4400 series. The wall bracket has a concealed customized keyhole tamper resistant security feature. The back of the body tube has a matching keyhole. This design allows authorized personnel to release the body from the wall for convenient emptying and cleaning without the need for a key. For those in need of a lighter weight solid aluminum ash receptacle for low traffic areas and tight spaces, these urn-shaped models are a perfect choice. The aluminum has a fine bright satin polish with a clear baked powder coat finish. The F203SA model is emptied by sliding the bodies off the back-plates. Covers are secured due to a spring action push button on 4400 and 2400 Series.